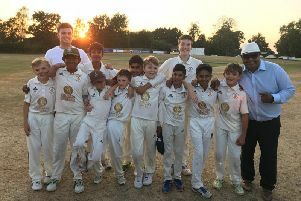 North Crawley picked up their first win of the Four Counties Division 1 season, beating rivals Milton Keynes by 26 runs. In a low scorer, John Collings hit 50 for the champions but they were skittled for 154 by a rampant MK bowling attack. In response, opening bowler Robin Platten started like a house on fire, taking out the top four batsmen as MK dropped to 64-4. Their slump continued and MK were bowled out for 128. New Bradwell climbed up to third in the league standings after making light work of Elstow. Harry Singh top scored for Bradwell with 73 as the visitors were bowled out for 228. But the reply was hampered as James McMillan and Kieran Lampard took four wickets apiece to reduce Elstow for 119. Manjit Singh’s 5-32 helped New City cruise to a 63 run victory over Thurleigh. Harsh Jethra scored 54 as New City scored 204 before Singh picked up the ball to tear through the Thurleigh middle order as they were skittled for 141. Olney lost to Eaton Bray, who now lead the division by 12 points. Wes Hosking (63) and James Flecknell (99) helped the home side to 278-5, but Olney were bowled out for 212 to lose by 66 runs. In Division 2, Printers (187) hit top spot by beating MK City (137) who now occupy bottom place in the table. Newport Pagnell (203) drew with Bromham (111-6) despite James Fletcher’s 82, while there were draws between Eggington Foresters (216) and North Crawley 2nds (183-8), Buckland & Aston Clinton (278-8) and Cranfield (227-8) and Open University and Old Bradwell. In Division 3, Shenley Church End (174-9) lost to Harlington (178-4) by six wickets, while Westcroft (181) crushed Ivinghoe & Pitstone (68) as Asad Shah hit an unbeaten 84. MK Warriors (117-4) are third in Division 4 as they cruised past New City 2nds (114). Olney 2nds (112) lost to Drayton Parslow (138), and Westcroft 2nds (174-9) held out for a draw with Caddington (228-6). Stewkley Vicarage (218) moved to second in Division 5 as they crushed Great Brickhill 3rds (80). New Bradwell (233-8) brought North Crawley 3rds (79) down to earth after their opening day victory, while Milton Keynes 2nds (177-4) beat bottom club St Andrews (175-4). Milton Keynes City 2nds (177) are top of Division 6 as they beat Aspley Guise 2nds (106), while Newport Pagnell 2nds (94) beat Wilden 2nds (82) in a low scoring affair. In Division 7, Printers 2nds are top after Wolverton 3rds cancelled. while New City 3rds (101-7) beat Great Brickhill 4ths (99), and Bletchley 3rds (100) lost to Edlesborough 2nds (102-3).